The purpose of this tool is to analyze Java™ class files in order to learn more about the dependencies between those classes. on each level mentioned above. Last but not least a popup menu on any class in the result table allows to start the dependency path tracker. 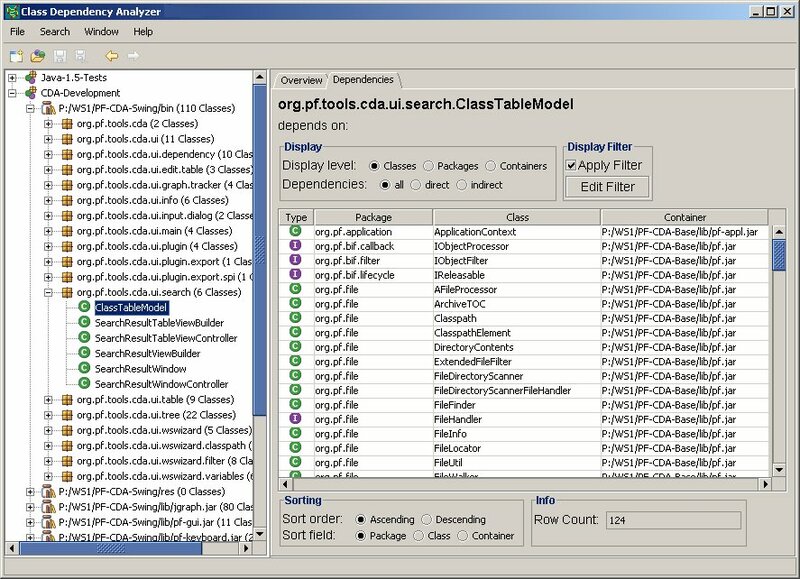 This tracker creates a graphical view of dependency paths that lead from the analyzed class to the class currently selected in the result table. This feature is very helpful if one wants to find out the best point to break a dependency. Unzip the archive pf-cda-x.x.zip to any directory you want to have CDA located in. Then ensure that environment variable JRE_HOME or JAVA_HOME is set to a Java Runtime Environment 1.8.0 or higher. As an alternative to the environment variables you can modify the cda.bat or cda.sh to do java execution as you prefer on your machine. To start the Class Dependency Analyzer just execute the cda.bat (or cda.sh). Currently there are no command-line options available. All possible customization are to be defined utilizing the properties of file config/cda.properties. After the main window was opened you need a workset. In a workset you typically specify all elements of a Java classpath that you want to analyze. To start with your own workset select the menu item File/New.... That starts a wizard you can use to create a new workset which refers to classes you want to analyze. As an alternative you can use the example workset (worksets/CDA.ws) to learn more about the tool's capabilities. To do this, select menu item File/Open.... In the succeeding file selection dialog go to the folder where you installed CDA. From there move to sub folder worksets and open workset file CDA.ws. This example workset contains all CDA JAR files. After opening it you will see the workset on the left in the tree view. Here you may select any child element and analyze it using either the popup menu or the accelerator key Alt+D. Since analyzing can last a while a progress monitor window pops up. It shows how many classes of all classes in the workset have been analyzed so far. Though usually not all classes have to be analyzed for one dependency detection process it is still recommended to wait until all loaded classes are analyzed. This represents a dummy container which doesn't exist in reality. All classes and interfaces that have been referred to but cannot be found in any container of the workset are assigned to this dummy container. This class container has been found and its content can be loaded into memory. An element that has been specified in the classpath but could not be found or cannot be loaded into memory. A Java package that has not yet been checked for its contained classes. A Java package that has been checked already for its contained classes. A class file that has not yet been loaded. Thus it is not clear whether it contains a Java class or interface. A class file that cannot be found or was corrupt so it could not be loaded into memory. A Java class that is part of the current workset and has been loaded into memory. A Java class with a main() method that is part of the current workset and has been loaded into memory. A Java interface that has been referred to but cannot be found and therefore is not in memory. A Java interface that is part of the current workset and has been loaded into memory already. A Java annotation that is part of the current workset and has been loaded into memory already. A Java enum that is part of the current workset and has been loaded into memory already. 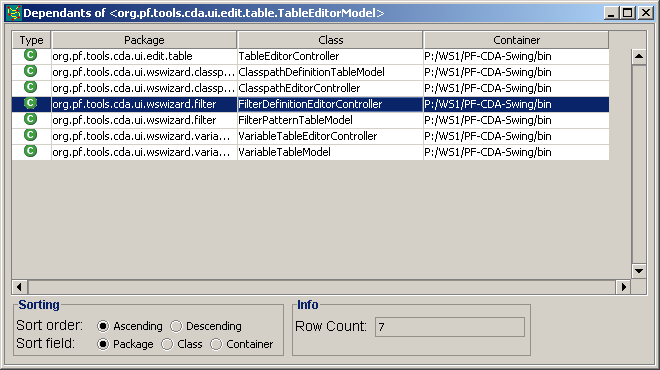 A table that shows all classes and interfaces the class ClassTableModel depends on. Shows all dependency paths from class RepeatedTest to TestListener. Since version 1.9.1 CDA supports a plug-in mechanism that allows developers to add their own custom extensions to the tool. Therfore the open source component Object Dependency Exploration Model (ODEM) was created to define an independent object model for dependency analyzers. The Javadoc of ODEM is included in the Extension SPI Javadoc. Beside the Javadoc for the CDA plug-in SPI the developer guide and a sample implementation (inluding source code) should make it very easy to develop your own plug-in. Since version 1.15.0 the CDA core implementation classes are documented via Javadoc and a section in the developer guide helps with utilizing CDA without its GUI. Current version of CDA is 2.2.0. It requires at least Java 8 to be executed. Have a look at release-notes.txt for details or get a quick overview of the most important changes below. In graph views the popup menu of visible elements now provides a new menu item: "Add dependants"
In graph views the popup menu of visible interfaces now provides a new menu item: "Add implementors"
New feature that allows to look-up all classes that implement a static main(String) method. Clicking on a disabled "Dependency" tab automatically executes the "Analyze Dependencies" action. Versions determined from manifest files are shown in tree view for class containers. All DTD files (workset-1.6.dtd, odem-1.1.dtd) are now declared by a public logical name and a URI that points to the file location in the web. CDA now supports ODEM/XML (export) files in a workset's classpath. Re-initialization of workset has been changed to be executed only when needed. A progress monitor window is shown now during the whole initialization process of a workset. The following list presents some of the features that are planned for future versions. Capability to define components (or modules) as a set of packages. Hiding of containers in the tree view, so that only packages are visible on the first level. This tool is currently available under the terms of the follwing license. It grants the right to freely use and share this tool. However, the source code is not available for download on the Programmer's Friend website. Only the binaries are free. At this place I want to thank all open source programmers who created great Java libraries that enabled me to efficiently build CDA on top. Also I want to thank yWorks. They allowed me to use free of charge promo version of their great graph library yFILES. Please send all bug reports, comments and suggestions to feedback@programmers-friend.org.